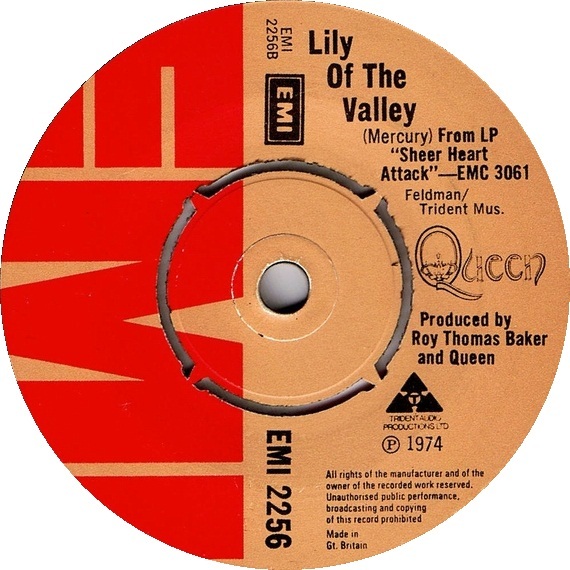 Lily of the Valley was B-Side to the 1974 hit single Now Im Here. "Lily of the Valley" features Mercury playing the piano and providing all of the vocals. The song has a reference to "Seven Seas of Rhye" in the line "messenger from Seven Seas has flown to tell the King of Rhye he's lost his throne". The song, together with "Tenement Funster" and "Flick of the Wrist", was covered by Dream Theater on the bonus disc of their album Black Clouds & Silver Linings.